M3 Consulting Group conducted research over the summer to assess grasshopper population levels utilizing unmanned aircraft and remote sensing equipment. The impetus for this research was interest by the USDA-APHIS-PPQ-CPHST Phoenix Lab's Rangeland Grasshopper and Mormon Cricket Management Team and the National Grasshopper Management Board. The goal of the research is to explore new methods for rangeland grasshopper and Mormon cricket surveys using remote sensing technologies. The detection of grasshopper and Mormon cricket populations during their early life cycle is an important goal of rangeland managers. Early life cycle control of grasshopper populations may result in less overall intervention as a control can be applied before breeding and egg deposit occurs. Fewer eggs deposited by the incipient population results in less control and follow on treatment needed in normal or emergency response scenarios. Unfortunately, there is a limited window of time, usually three weeks, to delimit and control immature populations. 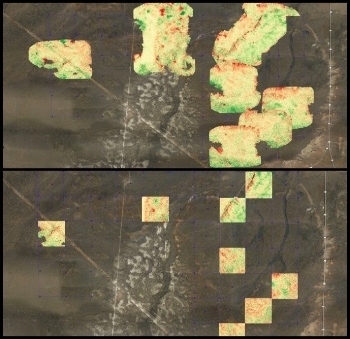 Given the vast areas of rangeland within the United States, research into improved survey methods are welcomed by stakeholders and range managers. A presentation will be given at the 2017 annual meeting of the Entomological Society of America. Dustin Krompetz and Michael Milam (M3 Consulting Group) will discuss the results of the research conducted by M3 Consulting Group and USDA-APHIS-PPQ-CPHST Phoenix Lab's Rangeland Grasshopper and Mormon Cricket Management Team over the summer. We will also discuss the proposed steps to advance methods for grasshopper and Mormon cricket survey and detection. M3 has determined that unmanned aircraft and ground roving survey vehicles may be able to supplement existing survey methods over the vastness of United States working lands.